The Pacific gopher snake (Pituophis catenifer catenifer) is one of eight subspecies of gopher snake. This snake grows as long as 7 feet and weighs between 2 and 4 pounds. A Pacific gopher snake has light brown or tan scales with large, irregular, dark brown splotches along the back and gray spots along the sides. The snake's belly is a lighter cream color with dark brown or black spots. Gopher snake species live throughout the western and midwestern United States. Their broad geographic ranges extend as far north as southwestern Canada and as far south as northern Mexico. The Pacific gopher snake subspecies, in particular, lives on the West Coast of the United States from Santa Barbara County in California north into Oregon. This carnivore thrives wherever prey is plentiful, including open grasslands, marshlands and all types of forests. The snake follows rodents and other small mammals to farms and suburban homes. Gophers indeed are Pacific gopher snake's primary prey. 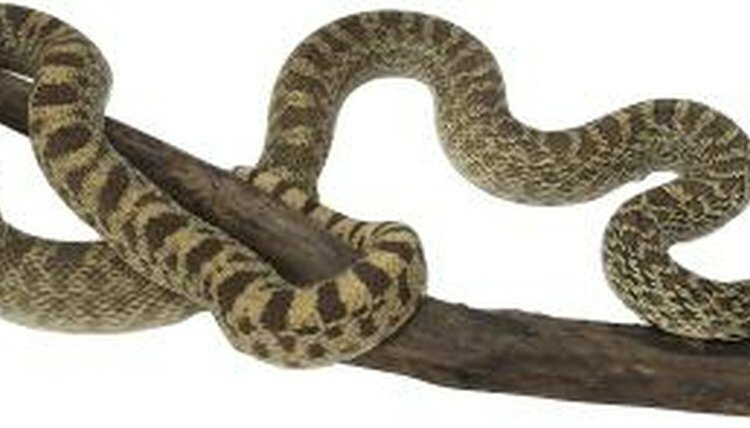 However, because these agile snakes are adapt at climbing and swimming, their diets are not limited to a single species. They consume other rodents and small mammals, birds, lizards, smaller snakes and amphibians. They also consume the eggs of birds and lizards. With such a varied diet, prey is usually plentiful, but gopher snakes are capable of surviving for long periods of time without eating. Pacific gopher snakes usually hunt during the day except in the hotter summer months, when they are more active after sundown. These snakes are nonvenomous constrictors; they kill their prey either by coiling around it and squeezing the animal until it suffocates or by pressing the animal against the walls of the underground burrow where it’s found. They locate and search borrows for gophers, voles and other rodent species that live primarily underground. When threatened, a gopher snake rears up and hisses, shaking its tail. Because this behavior mimics a rattlesnake's strike mode and because the two species look similar, people often kill a gopher snake in the mistaken belief that it is a venomous rattlesnake. However, the Pacific gopher snake -- every gopher snake species, actually -- is harmless to humans and beneficial to farmers in particular. A Pacific gopher snake preys on rodents and other small mammals commonly considered pests for the damage they do to agricultural crops. For this reason, farmers prize the species as a natural form of pest control.